Proud of Your Boy was an important song to the staff of Aladdin. It was written by Howard Ashman and Alan Menkin, the composing duo who also wrote the music for The Little Mermaid and Beauty and the Beast. The song focused on Aladdin’s relationship with his mother and Ashman said that it was his favorite song in the film. There are four videos below. The quality is rather poor, but Clay is wonderful in all of them. The first two are professional videos provided by Disney. The last two are interviews that Clay gave during the Aladdin press junket on September 27th. Gosh…I just love Clay singing "Proud of Your Boy". It is absolutely beautiful. Great background information about Clay Aiken's "Proud of Your Boy" performance for Disney's "Aladdin." It's a beautiful song, and I enjoyed the attached vides, too. Thnx for all that you do! I had never seen the Proud of Your Boy videos. Certainly demonstrates Clay Aiken's powerful voice. Loved seeing Clay Aiken working with Alan Menkin and the other Disney professional musicians. Clay fits right in with them. Beautiful song, beautiful voice. I'm anxious to hear Clay Aiken sing again. I really enjoyed watching the Proud Of Your Boy video again. I have that Aladdin DVD and I haven't watched it in a while. I was all excited when it came out and I went to my Walmart early the next morning to get one. I liked how Alan Menkin had to wipe a tear from his eye after Clay finished singing. They picked Clay because of his powerful voice. Wonderful choice. I also enjoyed the video when they were working on the video. You always pick such interesting topics. I loved the video of Proud Of Your Boy. I had purchased the DVD of Aladdin just to get the song from Clay. I am so glad they chose Clay to sing this song. I remember Alan Menkin saying they wanted him to sing because of his powerful voice. Clay was so young back in those interviews. He is just adorable…he certainly has matured since then. I enjoy the interesting stories you have each week. Clay's version of Proud of Your Boy was spectacular!! I just love listening to him sing it. Thank you for the videos and the informative blog!! 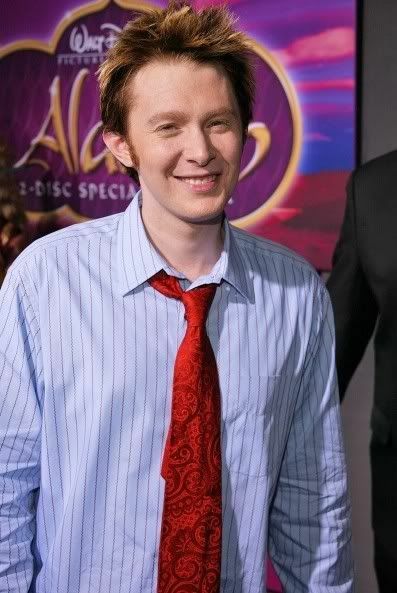 We are very proud of the man that Clay Aiken has become. Clay Aiken's "Proud of Your Boy" is a beautiful song. It's so emotional, you can't help but drop a tear or two. One of many of Clay's most beautiful performances! Just amazing. Clay's voice is so touching when he sings Proud of You Boy. You can tell how touched they all were with his voice. I loved Clay's wonderful vocal performance of Proud of Your Boy. His voice is perfect for Disney tunes so I hope Clay and Disney will partner in the future on other projects. Error: Error validating access token: Session has expired on Tuesday, 21-Aug-18 16:13:01 PDT. The current time is Thursday, 25-Apr-19 16:54:16 PDT.